Og det startede da også flyvende... Her er et UP biltransporttog på vej i forgrunden (mod højre), mens et par containertog ses i baggrunden. Toget længst til venstre kører på en bro som blev indviet i 2004 for at løfte BNSF's gennemgående trafik over de værste trængsler. Last day on the tour, and it was reserved for Kansas City. 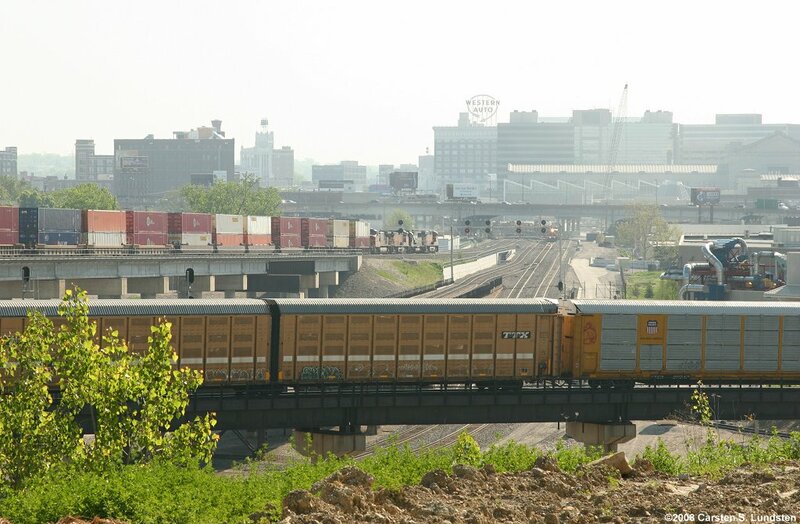 Kansas City is a huge junction for rail traffic in the Midwest, and here south of Downtown is a wonderful spaghetti of tracks that's impossible to describe in words. And we were off to a flying start... Here's a UP autotrain in the foreground (heading right) and 2 stackers. The train to the far left is on the flyover that from 2004 has lifted through BNSF traffic over the troubled junctions below.